Lately, I’ve been reading about artists, creativity, and the psychological eccentricities that draw the two together and force them into a lifelong bond. It is typical for artistic greats to be different from the mainstream, for they tend to be blessed with innovation, perseverance, and, well, a great deal of futuristic talent. If it were to have been different with Nina Simone, I would have been immensely disappointed. Needless to say, I was not. 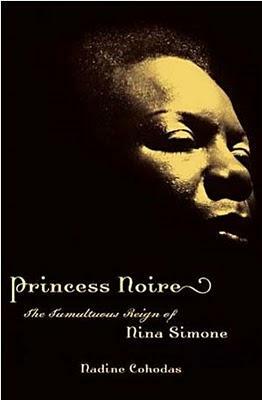 Although I'm not impressed with the title of this book, Princess Noire: The Tumultuous Reign of Nina Simone, because it gives the impression that Simone's life had been little more than bipolar, after reading its contents, I could understand why that title was chosen. Even still, Nina Simone’s work and talent demands great respect, as she was an instrumental figure in shifting both political consciousness and an innovative marriage of two strange bedfellows (classical music components and rhythm and blues). As Nadine Cohodas writes, Nina Simone was definitely no angel, and she didn’t always make sound business or personal decisions. She was an extremely temperamental, moody, and complicated soul. She demanded the best from herself, her musicians, and even her audience. Simone recreated the past when recounting her upbringing—sometimes more positively, other times more negatively, and many times leaving much out altogether. She had a version of multiple personality disorder, two unhappy marriages, and many blowups. Several notable artists were, and are, great because of the personal turmoil they endured. I am fully aware that there are artists who are great despite not having gone through traumatic tribulations, and I don't think one need go through such turmoil in order to produce great works; however, it seems to be a common theme in the creative world. Nina was a child prodigy. Beginning at the age of two and a half, she demonstrated the musical abilities that would manifest into remarkable piano virtuosity. With her family's cultivation of her talent, and the generosity of people with foresight that extended beyond the color of her skin, Nina was able to hone the talent inside her that would eventually touch the world. Her initial goal of becoming a prominent Black female classical pianist got transformed into a recipe of jazz, rhythm and blues, originality, political consciousness, and an activism that left its mark on time immemorial. Simone's self-proclaimed inability to fit in with most people has, ironically, united people everywhere. Her musical bravado infused with social consciousness paved the way for everyone from jazz great Ron Carter to hip-hop artist Talib Kweli. She helped get rid of the racially biased cabaret card and ways of conducting business in music. If this is how being different from the mainstream manifests, I’ll take it.